You should be able to get Symfony >=2.3 up and running before you can install the KunstmaanTranslatorBundle. default_bundle : Which bundles are used for the import functionality in the backend. Possible values: 'own', 'all', 'custom'. bundles : A list of bundles that will be used for the import functionality in the backend. Only used when default_bundle is set to 'custom'. Use the following command to generate a doctrine migration with all new and updated translations from your current environment. When you want to include these migrated translations into your (other) environment use the normal doctrine migrate command. 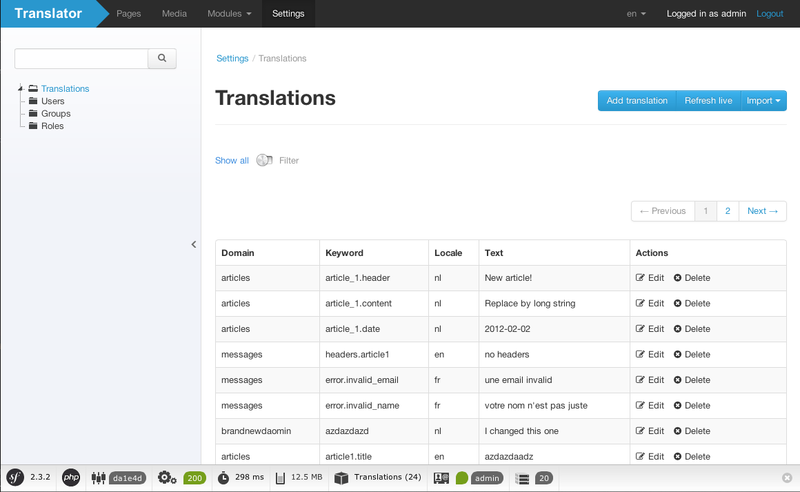 When migrating your current project you can easily import the existing translation files. Translations are stored in a database, but cached (as Symfony normally does) when not running in debug mode. When editing translations in the backend changes aren't immediately visible on your website. The backend will show a warning message when not newer or updated translations aren't loaded into the cache. Click on the Refresh live button to rebuild the cache. You probably don't always remember which keyword and/or domain your translations on specific pages are using. To solve this problem you can add an extra GET parameter to your request. Add ?transSource=1 to your url to see all sources of the translated labels. When you click on this item, you can see all translations used on the current request and a link to add or edit them in the Kunstmaan Admin backend. If you did 1 in dev, go to 4 of "Workflow example (new project)", otherwise go to 7 "Workflow example (new project)"